Gagra (Abkhaz and Russian: Гагра; Georgian: გაგრა) is a town in Abkhazia. It covers an area of about 5 kilometres. It is located on the northeastern coast of the Black Sea, at the base of the Caucasus Mountains. The moderate climate makes it a popular tourist resort. Gagra is the centre of the Gagra District. It is located in the western part of Abkhazia. The river Psou serves as a border with Krasnodar Kray of Russia. Gagra was established as a Greek colony. During the rule of the Kingdom of Colchis, they called it Triglite. In the time of the Roman Empire the town was renamed to Nitica. Because of its geographical and commercial importance, it was attacked repeatedly by the Goths. The Romans did not neglect it, however. They fortified it well. After the Romans, the Byzantine Empire took control of all of Colchis, including Nitica. It became a major trading center for merchants from Venice and Genoa. The name "Gagra" appeared for the first time on a map in 1308. This was on a map of the Caucasus made by the Italian Pietro Visconti. This map is now in the Library of Saint Mark in Venice. Palace of the Prince of Oldenburg. In the 16th century, Gagra was a part of Georgia. It was invaded by the Ottoman Empire. Because of poverty and disease, most of its people had left. After Russia's victory over the Ottomans in 1878, Russia rebuilt the town. View of Gagra's wharf sometime between 1905 and 1915. In 1919, Vladimir Lenin established a "worker's resort" in Gagra. He nationalised the resort that had been built by Oldenburg. Then Gagra became a popular holiday resort for Soviet citizens. During World War II, it gained a new role as a site for the rehabilitation of wounded soldiers. After the war, various state-run sanatoriums were built there. The resort grew and was developed quickly as part of the "Soviet Riviera". In the late 1980s, tensions grew between the Georgian and Abkhazian communities in the region. War started between 1992 and 1993. It ended in a defeat of the Georgian government's forces. Hundreds of thousands of ethnic Georgians were forced to leave their homes in Abkhazia. This was part of a mass ethnic cleansing, in which thousands of Georgian civilians were massacred. Gagra and the Abkhazian capital Sukhumi were at the centre of the fighting and suffered heavy damage. After 1993, Gagra was under Russian occupation and under the control of separatist armed formations. An early medieval church of the Protection of the Virgin. 19th-century palace of the Prince of Oldenburg. On 14 May 2012, Gagra signed a cooperation agreement with Vladimir. ↑ Murphy, Paul J. (2004). The Wolves of Islam: Russia and the Faces of Chechen Terror. Potomac Books, Inc. ISBN 978-1-57488-830-0. ↑ "Города Гагра и Владимир будут сотрудничать". Gagra District Administration. 14 May 2012. Retrieved 28 May 2012. ↑ Abkhazia is the subject of a territorial dispute between the Republic of Abkhazia and Georgia. 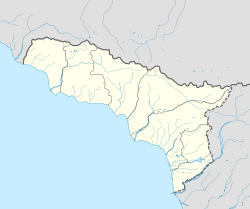 The Republic of Abkhazia unilaterally declared independence on 23 July 1992, but Georgia continues to claim it as part of its own sovereign territory. Abkhazia has received formal recognition as an independent state from 7 out of 193 United Nations member states, 2 of which have subsequently withdrawn their recognition. ↑ The Governor of Gagra District is at the same time Mayor of the Gagra municipality. Wikimedia Commons has media related to Gagra. This page was last changed on 8 April 2019, at 14:27.